This year, for the holidays, I made only one batch of sugar cookies.Â Instead of using the traditional recipe, I made a few modifications which included adding cocoa, ground cinnamon, ground chipotle, and ground cayenne to the batter.Â These cookies had a sweet and spicy flavor that made them interesting and satisfying without overindulging. 1-Preheat oven toÂ 375 degrees. 2-Mix butter and sugar, then beat in egg yolk and vanilla.Â Sift together dry ingredients, then combine with the wet ingredients to form dough. 3-Use a cookie scoop, or form into 1 tbsp. size balls, flatten slightly, and bake for 13-15 minutes. 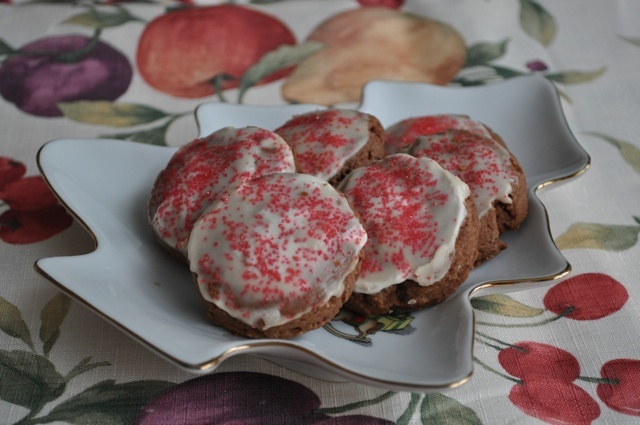 *Optional:Â The recipe for the glaze on these cookies, as shown, can be found on a previous blog post titled Holiday Sweets.